John Schad is Professor of Modern Literature at the University of Lancaster. He is the author of The Reader in the Dickensian Mirrors, Victorians in Theory, and Queer Fish: Christian Unreason from Darwin to Derrida (Sussex), the editor of Dickens Refigured, Thomas Hardy’s A Laodicean, and Writing the Bodies of Christ; and co-editor of life.after.theory. Someone called Jacques Derrida, someone called him on the phone, someone who was dead – this was August 22nd 1979. A mystery, he thought; but it is a mystery that began more than ten years earlier, in 1968, when Derrida, a philosopher, visits Oxford and there, before the very eyes of the Philosophy Sub-Faculty, he dies, several times. Murder, he thought. And so I shall investigate, and begin with a sign that the philosopher says he left within a book from the thirteenth century, a strange fortune-telling book that he had found in the oldest part of Oxford’s Bodleian Library. In the book are a host of cryptic questions, but the philosopher directs us to one in particular, a peculiar question about a boy, and the question is this: Does the boy live? The philosopher will not, though, give the answer; he requires, instead, that we go to Oxford to open the book for ourselves. So, I shall go. And, as I do, there is a phone call from a boy who had struggled to live. This boy was once my father, a man who, for the last five or six years of his life, suffered from some kind of terrible dementia. It was as if he had lost his memory and found someone else’s; for he spoke of appalling things, unspeakable things. Above all, he said, ‘I must telephone. He is murdering me.’ We have, it seems, another call from the dead and, perhaps, another murder on our hands. So, let us be going – and not just to Oxford in the late 1960s but also to an English public school in the middle of the Second World War. And much else may yet demand our attention, may yet act as clues – a forested silence near Freiburg, a stolen evening in America, an abandoned car in Paris. And all the while, all the while, the radio transmits, the TV is on, and, back in Oxford, analysts decrypt intercepted messages, a Jew investigates, the Great Dictator counts to six million, and Esther prepares to take the minutes. A compelling narrative journey with Oxford at its heart … that exposes and plays with personal and public history as well as literary and philosophical stories … Schad reads as he dreams, or dreams as he reads, and his reading is a beautiful performance of writing’s iterability. … What else can I say to the readers of Derrida? This book is calling you. A remarkable novel …both challenging and ultimately rewarding. Schad examines literacy as it stands – or maybe sprawls or even reclines – today in an experimental style that echoes a novel. He states that all the quotations are real, and referenced, except the ones that he makes up. Primarily he quotes Jacques Derrida, mostly from his The Post Card: From Socrates to Freud and Beyond, and his own father before he died. John Schad has written a moving memoir of his father’s life, taking as his starting point the last traumatic years (1992-96) marked by panicked and perplexing utterances prompted by the onset of Alzheimer’s … Schad has threaded through this intimate portrait of a dying father an elaborate engagement with the philosophy of deconstruction, and with a history of Oxford from the 1930s to the present. Creative writing, life writing and literary theory are brought together in this challenging text. ... Schad does three things. He tells his father’s story from schoolboy to Oxford undergraduate to Methodist turned Presbyterian minister to final dramatic demise. He interlaces his father’s life with the work of Jacques Derrida, drawing extensively on one of Derrida’s many experiments with the confessional mode, The Postcard: From Socrates to Freud and Beyond (1987), a puzzling book, part novel, part philosophical treatise, loaded with diary fragments and postcards from the edge that are richly suggestive and resonant in relation to Schad’s father’s life …. Between these two father figures Schad lays out a latticework of links involving the Second World War, anti-Semitism, blackmail, betrayal, horror, guilt, history, martyrdom, memory (false and faithful), resurrection and secrecy. The whole thing is framed by a piece of archival detective-work in the Bodleian to solve an Oxford mystery that would have Inspector Morse scratching his head. Major figures of the period like Gilbert Ryle, C. S. Lewis, and Hugh Trevor-Roper put in appearances in a work full of fascinating vignettes of academic in-fighting and high-table gossip. Schad shows the extent to which faith and reason are intertwined in the lives of his father and the philosopher who has shaped his son’s thinking, while bringing to vivid life a whole post-war intellectual milieu. ... One wonders what ‘Shad’ would have thought of his larger than life reincarnation in the pages of his son’s academic experiment. Schad cites Freud to the effect that ‘History is precisely the way we are implicated in each other’s traumas’ (p. 70). In its evocation of death and suffering, Someone Called Derrida is at once an intensely personal story and a tale of trauma that touches on larger issues of history and identity. It was Nietzsche who said, ‘When one hasn't had a good father, it is necessary to invent one’. Schad had two good fathers, but that, happily, has not prevented him from being inventive. The Glass (organ of the Christian Literary Studies Group);William Maley, Professor of Renaissance Studies at the University of Glasgow, and author of Nation, State and Empire in English Renaissance Literature: Shakespeare to Milton (2003), and editor, with Alex Benchimol, of Spheres of Influence: Intellectual and Cultural Publics from Shakespeare to Habermas (2007). John Schad deftly splices stories inherited from his two fathers, the real one from Oxford, a minister of religion who may have witnessed Satanic rituals as a boy, and the symbolic father coming from across the Channel who invented deconstruction. All the secrets and traumas of recent history return in this non-linear chronicle that throws new light on the divide between analytic philosophy and continental philosophy. This generates endless narratives in which verve, erudition and suspense appear laced with wry Freudian Schadenfreude. Should we laugh when philosophy discloses old skeletons in its libraries, or just follow odd couples like Derrida and Gilbert Ryle, Hugh Trevor-Roper and Paul de Man, Elijah and Aleister Crowley since they seem to hold the key to the murder mystery? Or, should we attend to one single question: can I die of a death that is not mine? “One of the many unique features of this intriguing, emotionally powerful, and disturbingly entertaining book is that it brings together three real people in what turns out to be (at least) a triple mystery involving Jacques Derrida, John Richard Schad, and John Schad, the author himself. The title refers to an uncanny event in which someone called Derrida on the phone on August 22, 1979, and identified himself as Martin Heidegger, who had died in 1976. Derrida was a Jew; and while Heidegger had been the Rektor of Freiburg University in 1933, he dismissed Jews from the faculty of the University, including philosophers with whom he had been professionally and personally associated. Derrida’s philosophical writing, nonetheless, was pervasively influenced by Heidegger. 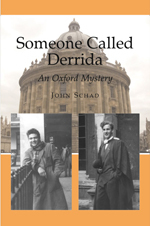 John Richard Schad, the father of the author, who suffered from dementia during the last five or six years of his life, was a minister of religion in Oxford; he and Derrida were both born in 1930. The book opens in the author’s own voice: ‘It is late, later than I think, and I am reading; but even while reading I keep drowsing and dreaming, and often I am dreaming that I am still reading.’ This is an ordinary enough situation, but it is also mysteriously uncanny in that it is reminiscent of similar situations in Poe, as in his poem ‘The Raven.’ The book Schad is reading is Derrida’s ‘The Post Card: From Socrates to Freud and Beyond,’ in which there are several references to Poe’s story ‘The Purloined Letter.’ Throughout his book, Schad quotes freely from the Derrida text that he is reading (these quotations appear in italics), but he also weaves into these italicized passages and his own prose quotations from his father as he was wasting away from Alzheimer’s during the years 1992–96. Those utterances were recorded by John Schad's mother, and they are included as an appendix to the book. Essentially, then, what is happening is that the author (John Schad) is mediating between the text he is reading (Derrida's) and the final words of his father (John Richard.) The mystery begins, however, not just when Shad begins to discover striking connections between Derrida's and his father's texts but especially when he realizes that there are certain passages that seem to be directed specifically to him. An important part of what he begins to discover is that both Derrida and his father keep coming back, however obliquely, to the scene of a murder, or perhaps more than one. Schad never lets us forget how often Oxford has been a place of mystery and intrigue. Not only were there the fictional detectives – Lord Peter Wimsey, Prof. Gervase Fen, and Inspector Morse – but there were also many non-fictional ones as well: Gilbert Ryle, Hugh Trevor-Roper, and A.L. Rowse. Here the history of Oxford's complicity in appeasement efforts with the Nazis during the 1930s becomes an important part of the mystery. Schad also narrates very well several events from Derrida's life, including his visits to Oxford, his arrest in Prague, his obsession with a dog called Fido, his reaction to the Paul de Man affair, his encounter with Schad in a hotel near Loughborough, and his terminal illness.